I love making, serving, and eating savory tarts. Perfect as make ahead dishes, they can be served room temp, and they taste delicious too. Plus, you can put practically anything in them. I felt like snacking on a big bowl of salty homemade potato chips today, but didn’t want to deal with the guilt and mess of dragging out my deep pot, filling it with oil, and dropping paper thin slices of potato into the golden roil. I figured that if I at least turned potato chips into a viable dinner option, it would be worth the effort and lost belt notch. 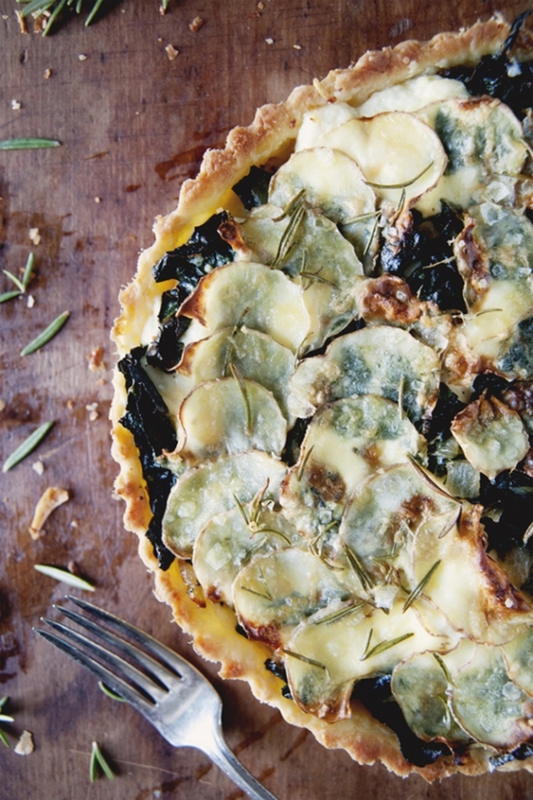 So here we have a hearty little tart, filled with kale, ricotta, and sautéed onions, and topped with paper thin potato slices that crisp up beautifully in the oven. The trick here is in how thin you can get your potatoes. I used a hand mandoline (I found mine in the kitchen utensil aisle next to things like avocado slicers and garlic presses), and put it on the thinest setting, so I could see light coming through the potato slices. Crispy and golden brown on top, hearty and filling inside, all nestled in a flakey, tender tart crust. Potato chips? Bah! 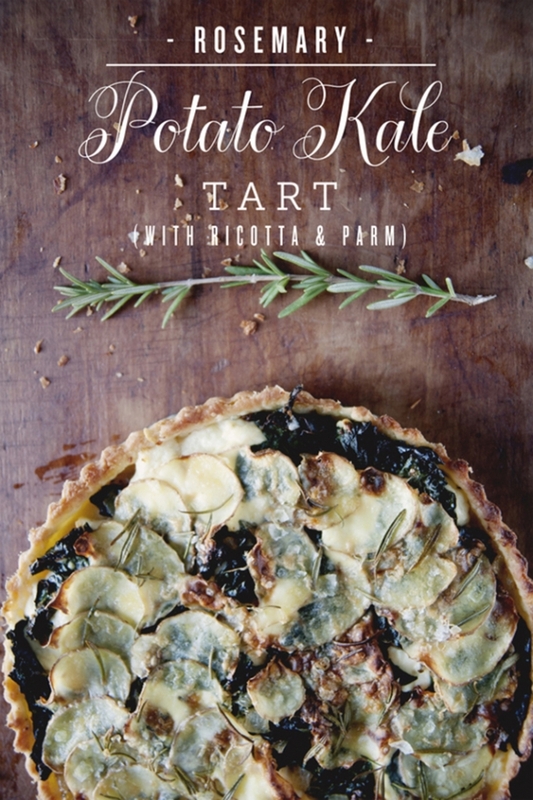 Sign me up for a savory tart instead. 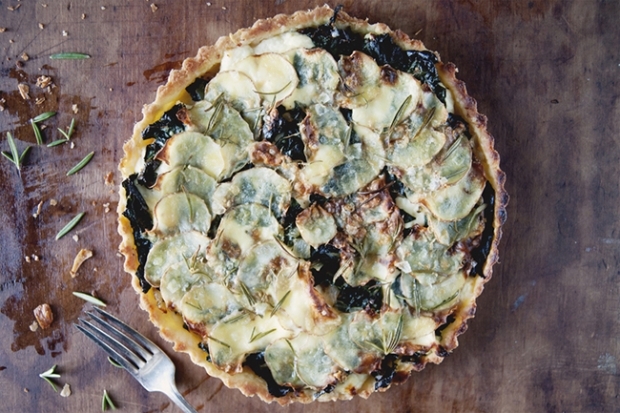 This is a double crust recipe, so you will only be using one for the tart. Refrigerate or freeze the other one for future use. Pre heat oven to 425 F. Unwrap and place one of the doughs on a well floured surface. Sprinkle with flour, and roll out with a rolling pin (turning often to get an even thickness) until the dough is about a 1/4 inch thick and about 11 inches wide. Place the dough into a tart pan (with a removable bottom) and press in the sides. Trim off the top of the dough, place a small sheet of parchment paper on top of the bottom of the tart, and fill with pie weights or beans. this will prevent the dough from rising and will keep the sides from shrinking down. Bake on the center rack for 10 minutes, then turn down the heat to 375 F, remove the parchment and weights/beans and bake for an additional 10 minutes. Remove the tart from the oven. It doesn’t have to be cool to continue. Set oven back to 425 F.
In a large sauce pan, melt butter and add onions. Cook for 10-15 minutes. Add garlic, cooking for 1 minute, then add kale and drizzle. Season with salt and pepper and a pinch of chili flake. Cook for 5-10 minutes, until kale is wilted. Take off heat and mix in ricotta and chopped rosemary. Top with a layer of thinly sliced potatoes. Drizzle with olive oil (you want the potatoes well coated, as this will make them crisp) top with rosemary leaves and parm. Sprinkle some salt and pepper on top. Bake for 20 minutes and then broil for one minute, or until golden brown and crispy on top.